You are currently browsing the tag archive for the ‘The Huntington’ tag. 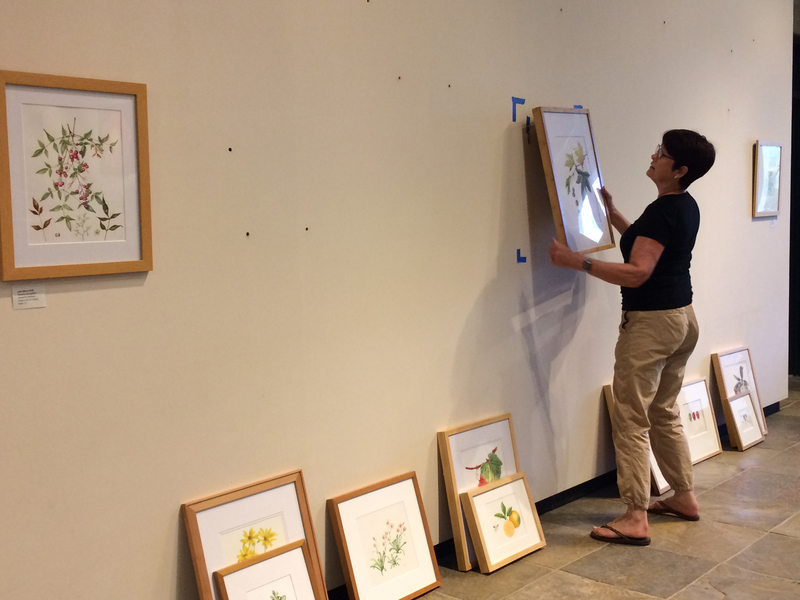 Carrie Di Constanzo will be teaching a BAGSC-sponsored workshop, entitled Creating Botanical Paintings with Impact Using Gouache. Participants in this workshop will learn how gouache is used to create realistic and detailed botanical paintings. Explore the benefits of using gouache and the similarities and differences between gouache and watercolor. Demonstrations will include using light washes of gouache, layering of colors with a dry brush, mixing of colors, glazing, and using semi-transparent and semi-opaque gouache. 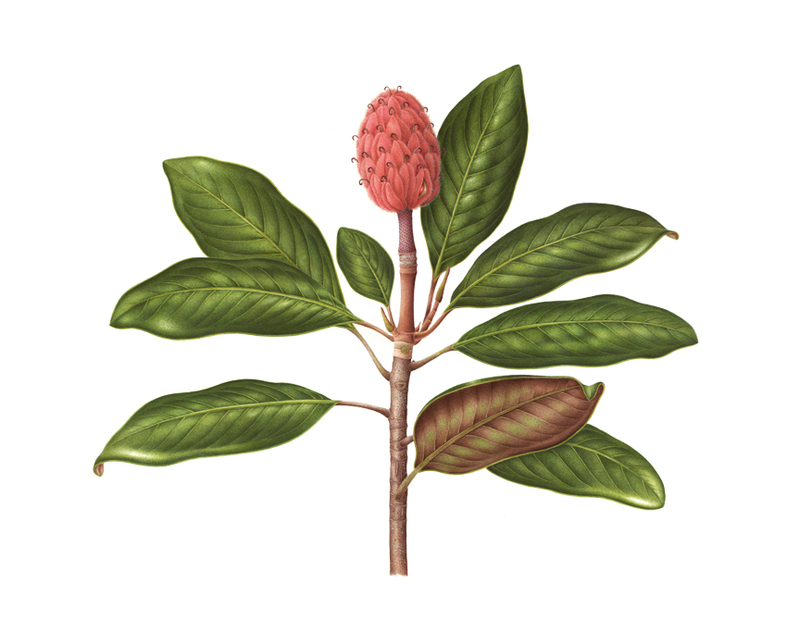 The class will be encouraged to experiment with gouache using small botanical subjects. The cost for BAGSC Members is $300; non-members may also attend for $350. Maximum Registration: 16 students. To register: Send a check in the full amount, made out to BAGSC, with Carrie Di Constanzo on the subject line. Please mail the check to: BAGSC, PO Box 50166, Pasadena, California 91115. More information, materials list and map are available on the BAGSC website. Carrie Di Costanzo worked as a fashion illustrator before shifting her focus to botanical art. 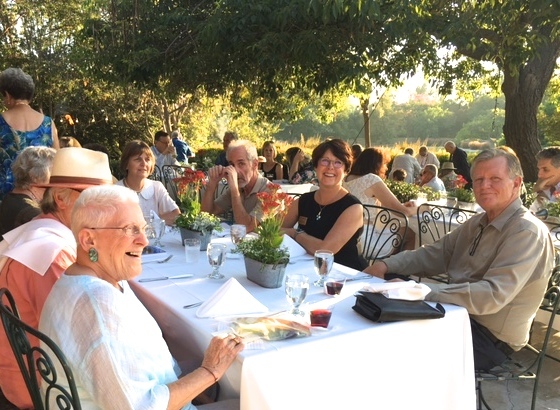 Group exhibitions include the 14th Annual International through the 20th Annual International with the ASBA/HSNY (receiving the Ursus Award in\2013); “Following in the Bartrams’ Footsteps” and “Weird, Wild, and Wonderful” and the 14th through 19th Annual Botanical Art Exhibit at Filoli (receiving the Roth Award in 2013 and the Jurors’ Award in 2014). 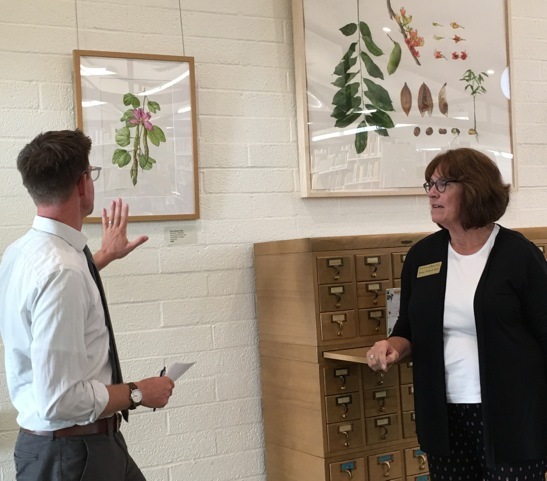 Her work is held in the Botanical Collections at The Huntington Library, Art Collections, and Botanical Gardens, The Hunt Institute for Botanical Documentation, and private collections. 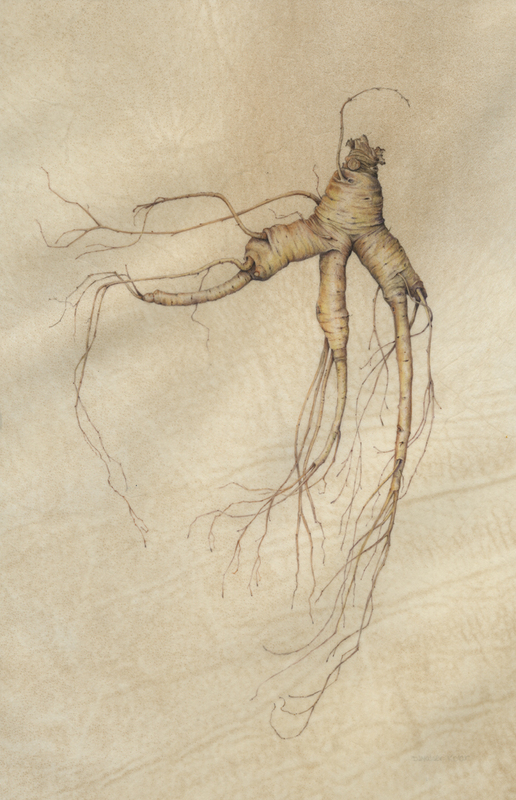 Ginseng, watercolor on vellum. Denise Walser-Kolar, © 2017, all rights reserved. Denise Walser-Kolar will be teaching the first BAGSC-sponsored workshop of 2018, entitled Roots and Leaves on Vellum or Watercolor Paper. 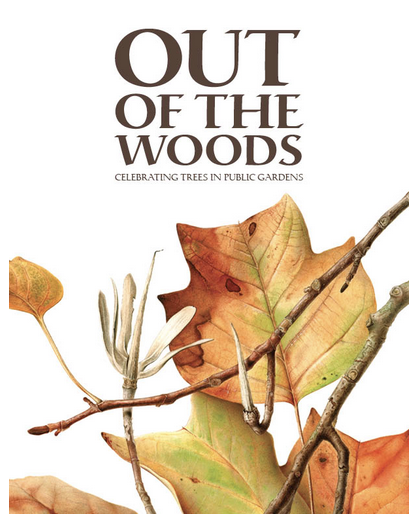 This workshop will focus on drawing and painting roots and leaves, starting with exercises observing and drawing roots and leaves. The balance of the workshop will concentrate on painting several small leaf studies. Students may work on either vellum or paper. Vellum will be available to purchase from instructor; students wishing to work on paper will bring their preferred materials. The class also will cover mixing greens, creating dark shadow colors, and mixing light delicate colors necessary for painting roots. 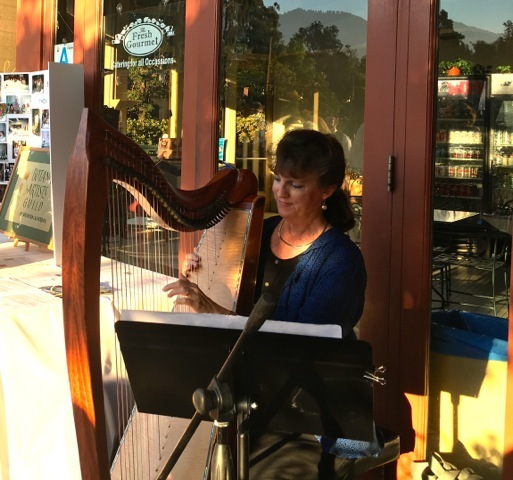 Denise is known for her thorough demonstrations, discussion of materials and techniques, hands-on time for developing skills, and lots of individual attention and feedback. To register: Send a check in the full amount, made out to BAGSC, with Denise Walser-Kolar on the subject line. Please mail the check to: BAGSC, PO Box 50166, Pasadena, California 91115. 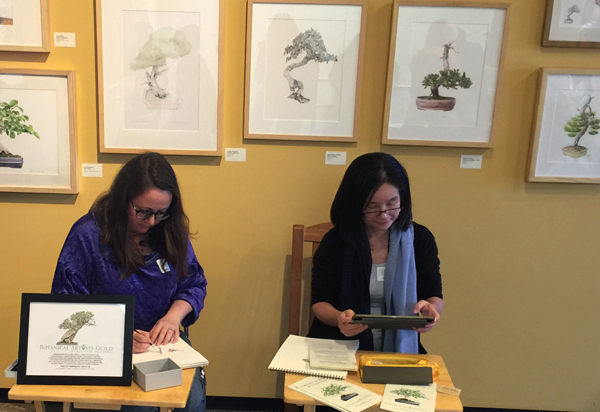 Denise Walser-Kolar began her journey into Botanical art in 2003, after receiving a botanical art class from her parents as a birthday gift. She has a degree in Graphic Design and Illustration from the College of Visual Arts in Saint Paul, Minnesota. 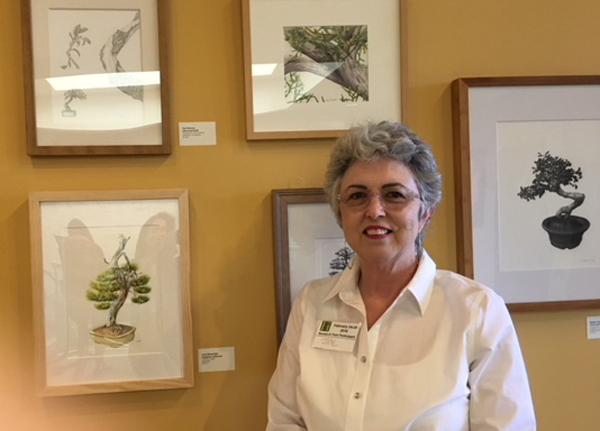 Denise teaches botanical art workshops across the country and currently works for the American Society of Botanical Artists as the Annual Meeting & Program Coordinator. She received the Diane Bouchier Artist Award for Excellence in Botanical Art in 2015 and received a Silver-Gilt medal from the Royal Horticultural Society in 2011 for her paintings of the hazelnuts of Badgersett Research Farm. Her work is held in the permanent collection of the Hunt institute for Botanical Documentation. The exhibition wall faces the stairway in the Brody Botanical Center. The BAGSC logo is a permanent sign, and information about BAGSC and ASBA is available as a handout. Photo by Janice Sharp, © 2017. 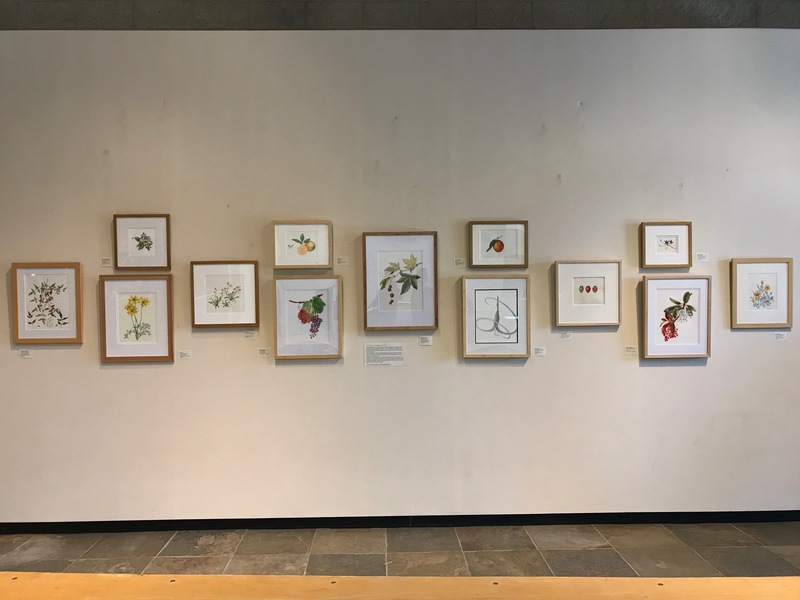 BAGSC’s latest exhibit at The Huntington Library, Art Collections and Botanical Gardens, “Inspired by Latin America,” is now open in the Brody Botanical Center. The art was hung on September 5, 2017, and the show will run through to January 15, 2018. Eleven paintings by eight BAGSC artists are featured in the exhibition, including Melanie Campbell-Carter, Sally Jacobs, Arillyn Moran-Lawrence, Kathly Powell, Olga Ryabtsova, Mitsuko Schultz, Janice Sharp, and Deborah Shaw. Janice Sharp and Andrew Mitchell review the plans for the exhibition layout. Photo by Beth Stone, © 2017. 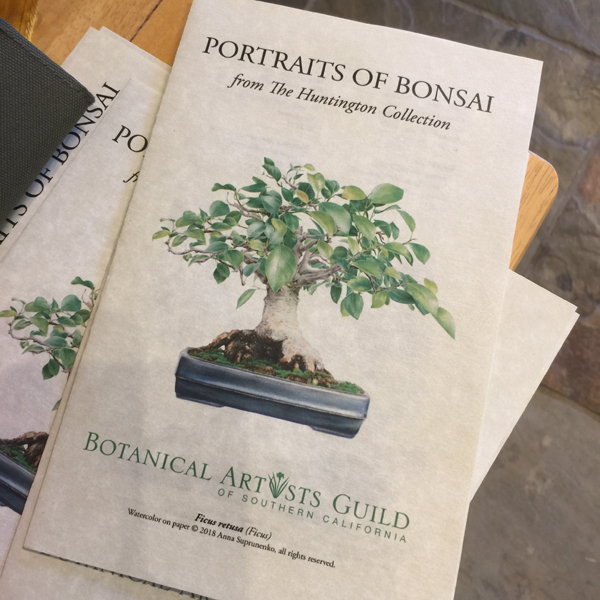 We thank The Huntington for providing the beautiful new signage identifying the artwork on the wall as belonging to the “Botanical Artists Guild of Southern California.” The plexi banner will be a permanent feature of the display. We have also added a container to dispense handouts. For this exhibit, the handout lists the artists and their paintings, with information about BAGSC and ASBA on the back. We also thank Andrew Mitchell for his patience with us in hanging the artwork. 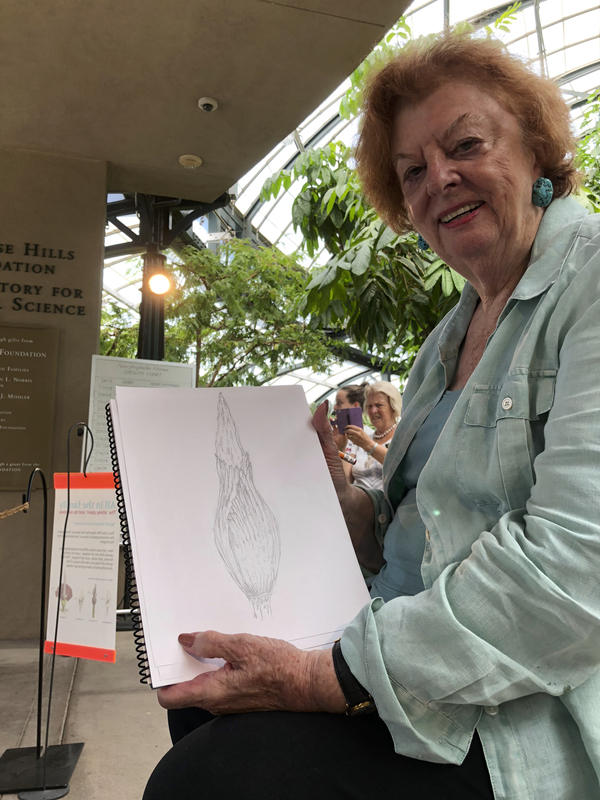 On September 6 – 8, 2017, Marjorie Leggitt taught at BAGSC-sponsored workshop entitled “Fresh Art: Pencil and Paint in the Garden” at The Huntington Library, Art Collections and Botanical Gardens. Marj expertly led us on a scary path down the road of fast drawing and minimal supplies. This class presented a unique opportunity to escape the classroom and venture out into the gardens. We were all grateful that it was cooler than previous weeks, so we enjoyed being outside. It was great, challenging and yes, frustrating, to use quick techniques: modified blind contour drawing; big wet brushes and simple pallets. Each designed to shift our focus away from the tools and back to observation of our subject. We came away with good tips which we can apply to making thoughtful studies or even initial drawings for a full botanical rendering. Photo credit: © 2017, Beth Stone. Photo credit: © 2017, Janice Sharp. 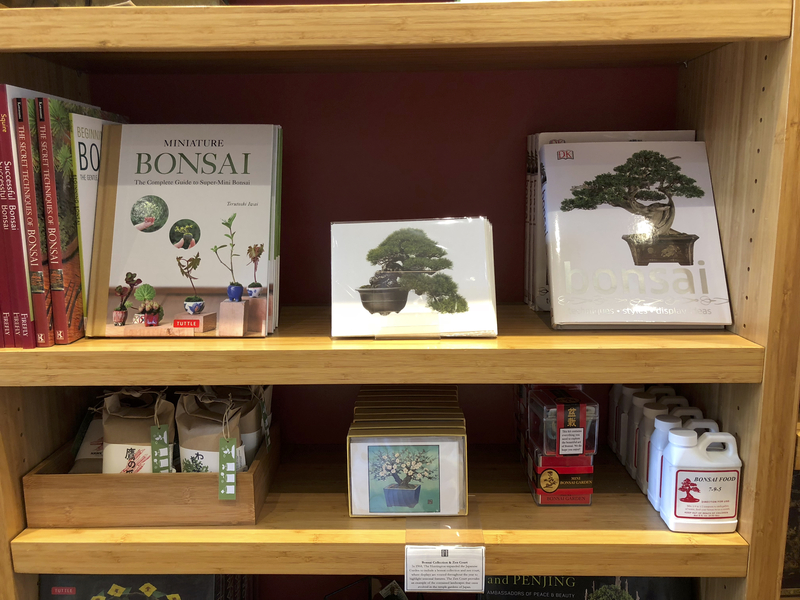 In preparation for the upcoming BAGSC Exhibition, Ficus at San Diego Botanic Garden, here is a bit of information about this extraordinary group of plants. We’ll start with the one most of us know best: the edible fig. Ficus carica, has been in cultivation since ancient times. 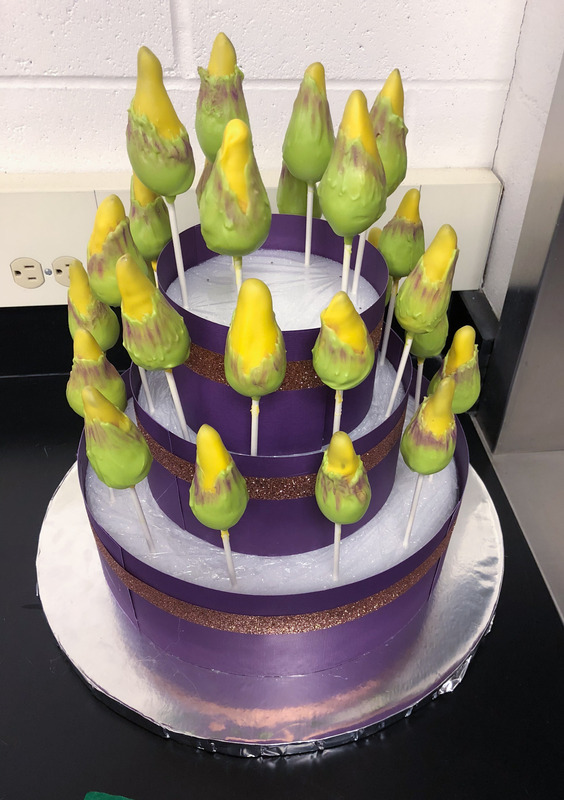 Though humans typically eat only this species of Fig, others are considered to be keystone species in their habitats, providing food (leaves as well as figs) and shelter for a wide variety of mammals, birds and insects. Several species are plants of special significance in many cultures. For example, Ficus religiosa, the Bo Tree, is said to be the tree under which Buddha sat while gaining enlightenment. 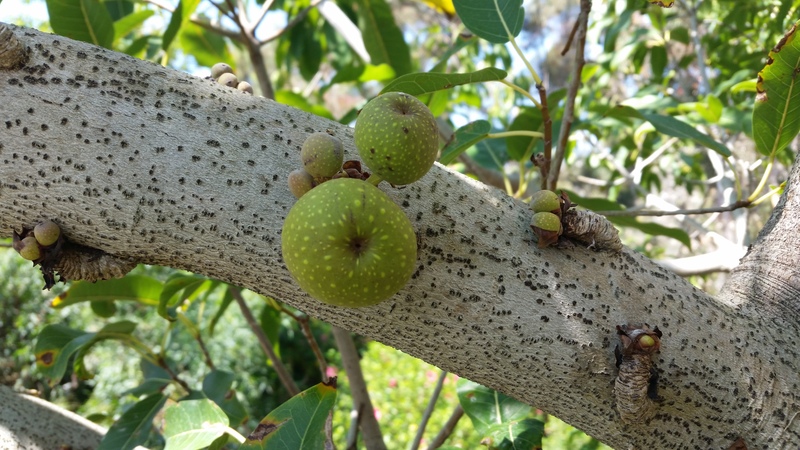 Some figs are cauliflorous, a botanical term for plants which have flowers and fruits growing directly from their main stems or woody trunks rather than from new growth. The word comes from Latin. Caulis means trunk or stem and Flory means flower. Photo by Lesley Randall, © 2017. The genus Ficus is a member of the Moraceae, or Mulberry Family. There are more than 800 species of Ficus. Most are tropical, but there are some species that survive in more temperate zones, such as the edible fig. The genus is highly diverse, with species growing as epiphytes, massive banyans, stranglers, shrubs, caudiciforms, vines and small trees. They are found from rainforests to dry rocky deserts. So what makes a Ficus a Ficus? Ficus auriculatus cut to reveal the interior and white latex. Photo by Lesley Randall, © 2017. There are a couple of key characteristics that separate this group. 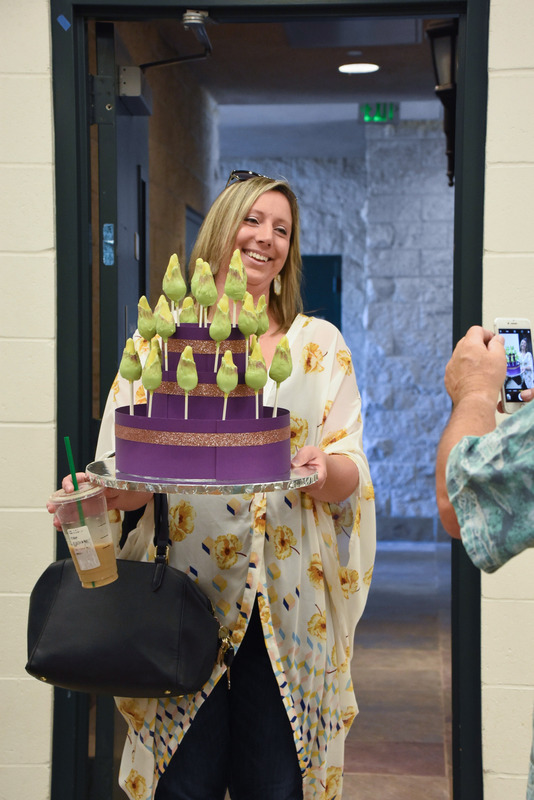 First is the unusual flower/fruit arrangement—the fig itself. Known as a syconium in botanical lingo, the fig is an urn-shaped structure lined with tiny flowers on the inside. 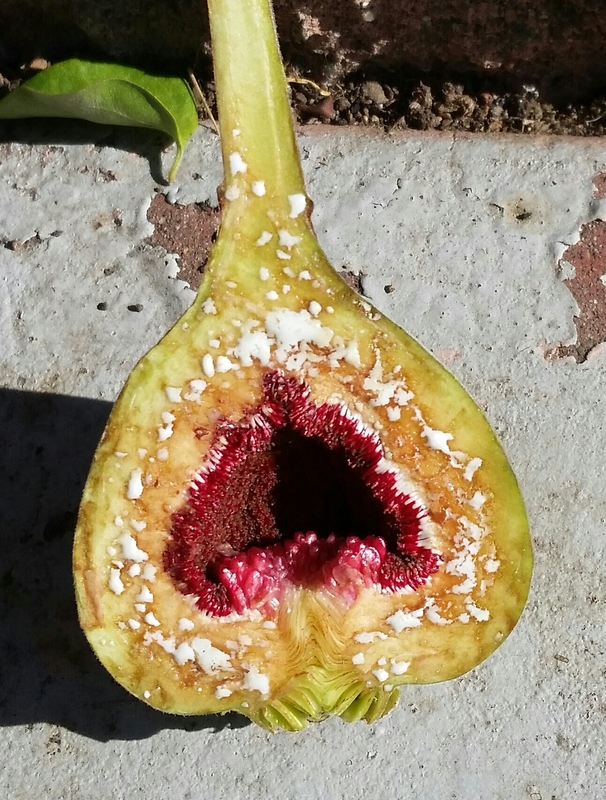 The flowers are pollinated by a specialized group of wasps that enter the syconium through an opening called an ostiole. The second key characteristic are the paired stipules that enclose the developing leaf. Though these often drop off as the leaf begins to unfold, they leave a distinct scar at the base of the leaf. The stipules may be separate, or fused into one structure. The third key characteristic is the sap: a striking white or yellow latex. Other characteristics to note are: an alternate leaf arrangement, and typically, pinnate venation. All figs share these characteristics that, combined, distinguish them from other plant genera. How these characters are expressed are what makes the group so interesting. The syconium can be as large as a baseball or less than a centimeter wide. It may be scaled or smooth, sessile or stalked and borne in leaf axils or on the main branches and trunk (cauliflorous.) The leaves are typically entire, but several species have lobed leaves. Leaves may be thick and tough, light and delicate, very large or very small. The bark can be smooth, rough, or in the case of a couple Australian species, corky and fire retardant. 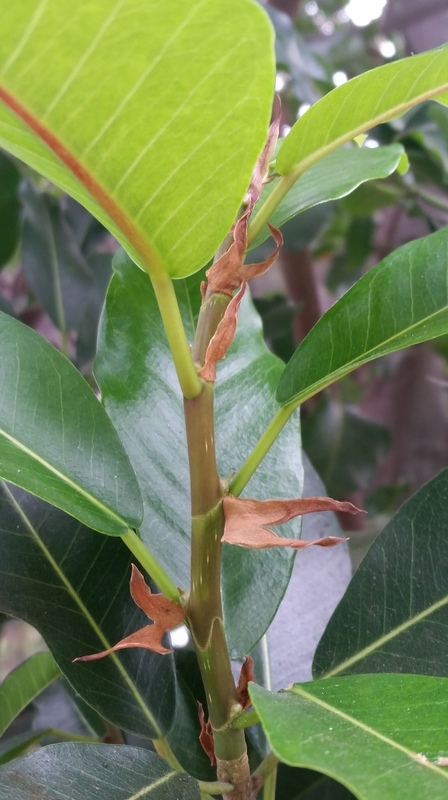 Ficus with stipules and scars. Photo by Lesley Randall, © 2017. 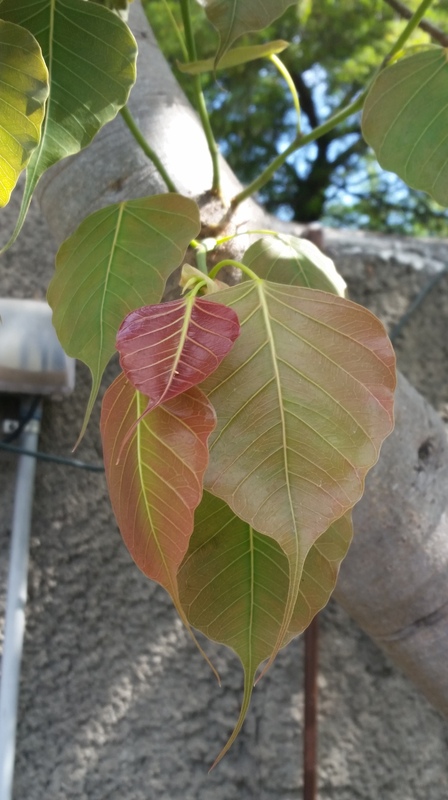 Where to find Ficus in Southern California? 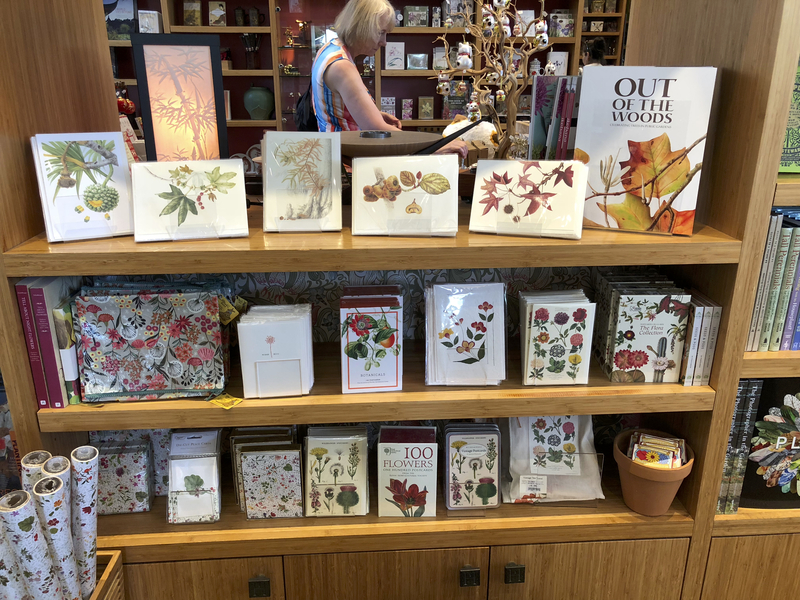 The Los Angeles County Arboretum & Botanic Garden, San Diego Zoo, and San Diego Botanic Garden all have nice collections. 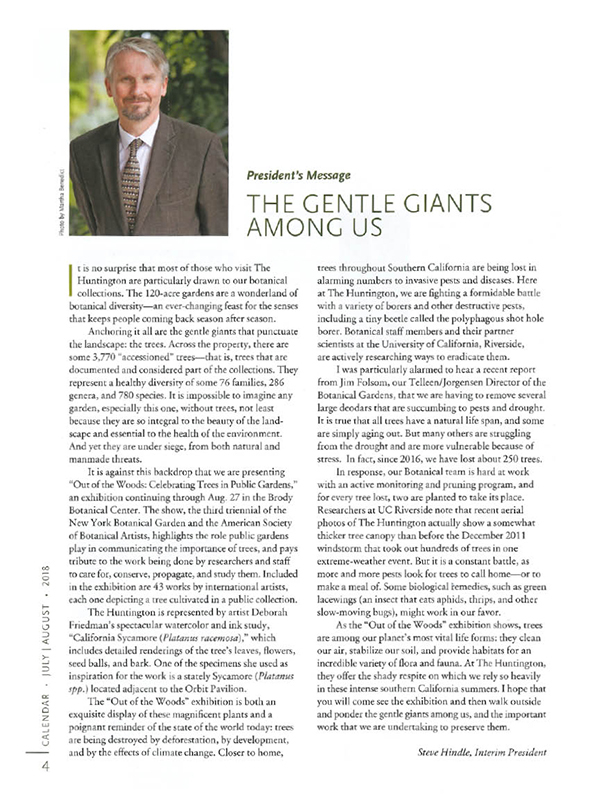 The Huntington Library, Art Collections and Botanical Gardens have some as well. They also can be found in parks, lining city streets, in back yards, as house plants, in nurseries and as Bonsai specimens. Want to learn more? Check out Fig Web which has information on specific species as well as general information on the group. BAGSC members who are interested in organizing and/or attending expeditions to find and paint specimens should let us know your interest and stay tuned! 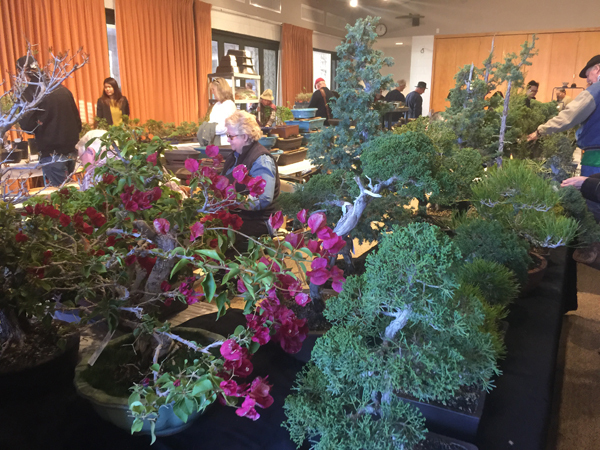 Information about the Ficus exhibition at the San Diego Botanic Garden can be found on BAGSC’s website. Information about the “Call for Entries” can be found on the “Members Only” page of the BAGSC website. Ficus religiosa, the Bo Tree, with reddish new growth. Photo by Lesley Randall, © 2017. 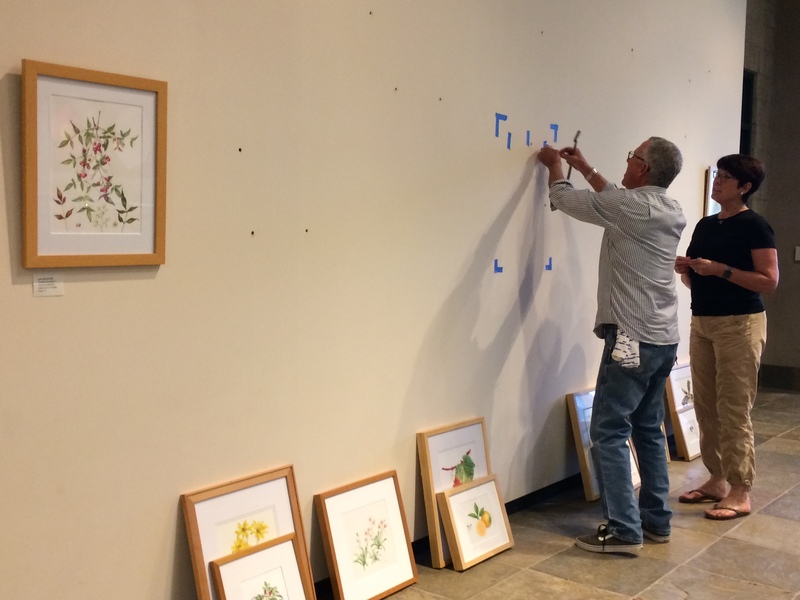 Andrew Mitchell (left) and Janice Sharp (right) mark the wall for hanging the paintings. 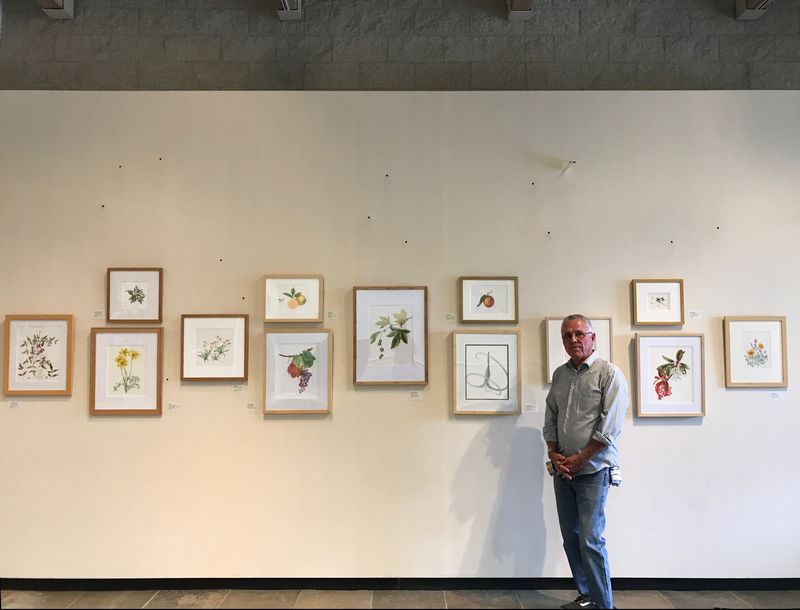 The first art exhibition by the Botanical Artist Guild of Southern California in the Brody Botanical Center at The Huntington Library, Art Collections, and Botanical Gardens has been hung… and it is beautiful! 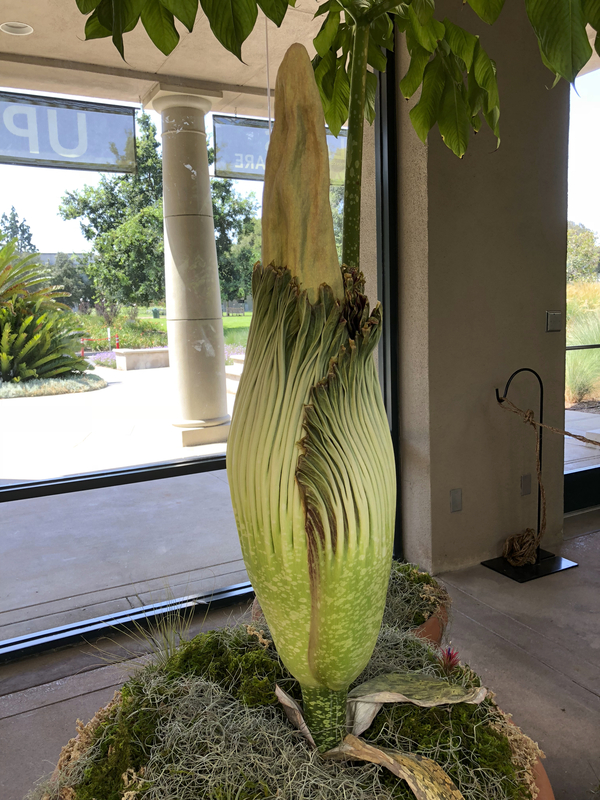 This show, Inspired by California, features plants that are both indigenous to California as well as plants that have become synonymous with California. Janice Sharp hanging one of the selected artworks. Thirteen of the entrants were selected for hanging. We congratulate Diane Nelson Daly, Estelle DeRidder, Patricia Mark, Terri Munroe, Gilly Schaffer, Deborah Shaw, Mitsuko Schultz, Janice Sharp, Beth Stone, Ellie Tu and Jude Wiesenfeld on their outstanding submissions. We thank The Huntington for the exhibit space, Jim Folsom for the inspiration that resulted in the exhibition, Robert Hori for the inception and logistics, Andrew Mitchell for the designing and hanging of the exhibit and Melanie Thorpe for all the details. Andrew Mitchell with final exhibition display. Inspired by California will run from June 1, 2017 to August 15, 2017. 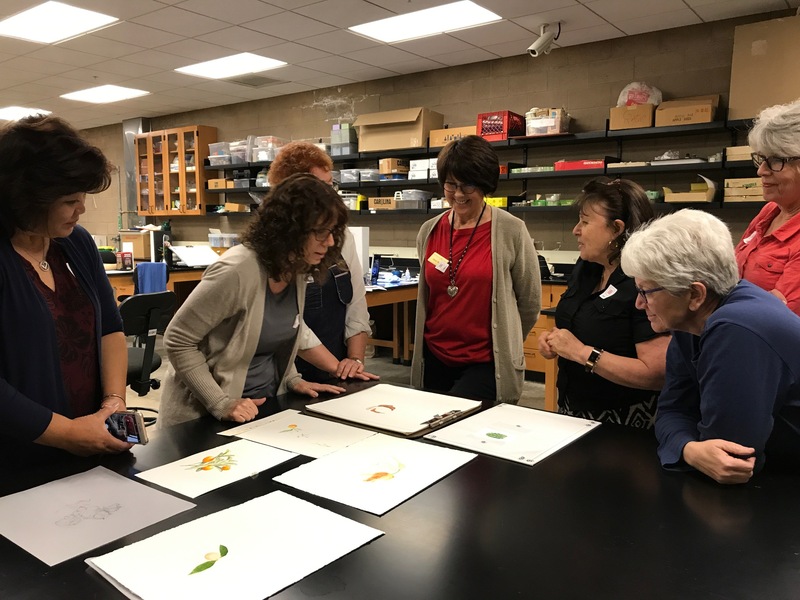 Current and future exhibitions in the Brody Botanical Center will coincide with events and seasons at The Huntington. In September, Inspired by Latin America will take the place of the current exhibition. Inspired by Latin America will shown from September 1, 2017 to January 15, 2018. BAGSC member entries will be due no later than August 1, 2017. See the “Call for Entries” page in the “Members Only” section of the BAGSC website for further details. Inspired by California can be seen with admission to The Huntington during regular business hours. There are no additional charges. 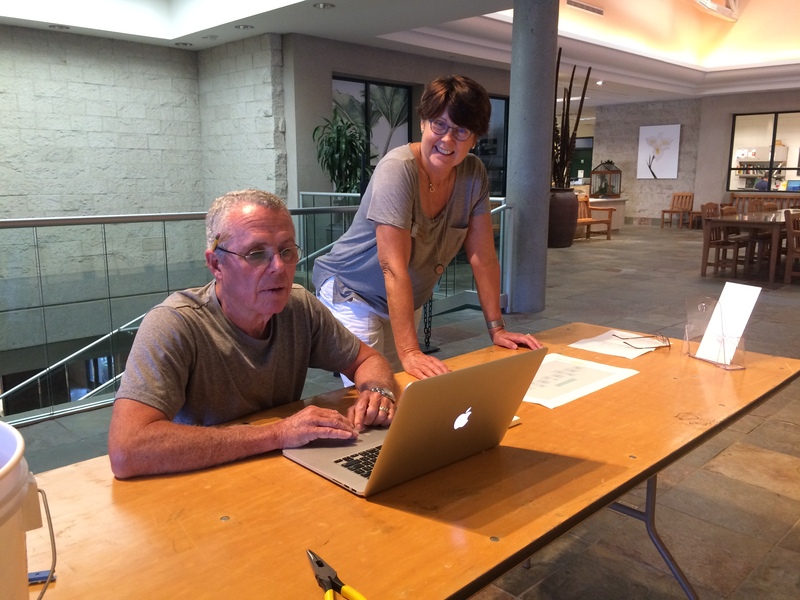 The exhibition is in the main lobby area of the Brody Botanical Center. The Huntington is located at: 1151 Oxford Road, San Marino, CA 91108. 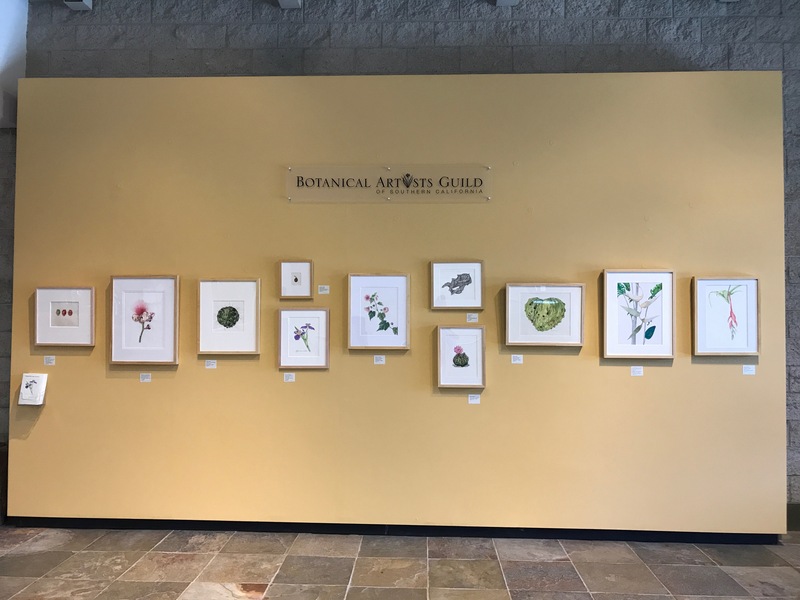 “Inspired by California” by the Botanical Artists Guild of Southern California, in the Brody Botanical Center at The Huntington. Signage about the paintings and information about BAGSC was added after this photo was taken. 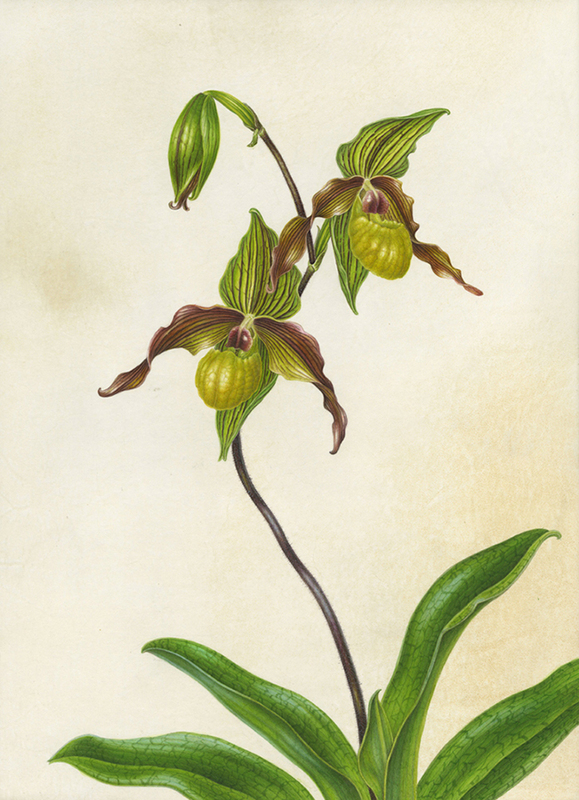 Paphiopedilum ‘Hideki Okuyama’, © 2017, Carol Woodin, watercolor on vellum, all rights reserved. 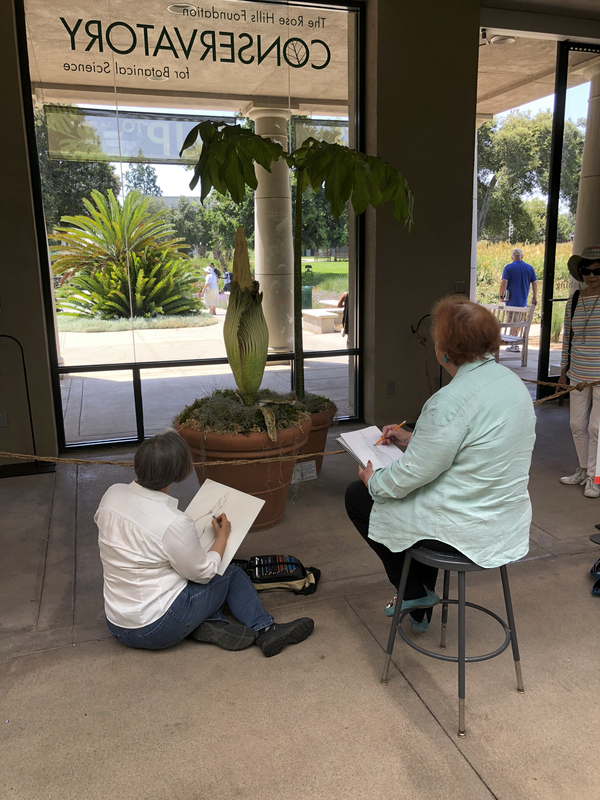 Carol Woodin will be teaching a workshop entitled “Painting Orchids in Watercolor on Vellum” at The Huntington Library, Art Collections and Botanical Gardens, June 2, 3 and 4, 2017, from 9:30 am – 4:00pm each day. There are still some spaces available in this coveted workshop, with subject specimens specially selected from The Huntington’s prized Orchid collection. 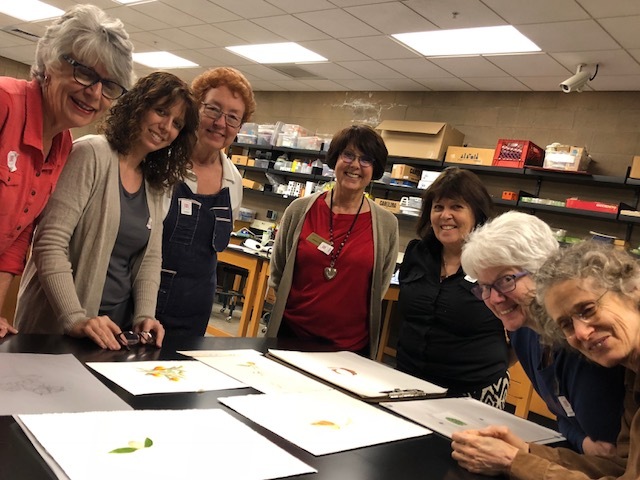 In addition to teaching about painting on vellum, and all about orchids, Carol will demonstrate how to select, cut and stretch vellum over a board. The cost to BAGSC Members for the three-day workshop is $250; the cost for Non-Members is $275. Payment should be received by BAGSC by Saturday, May 27. 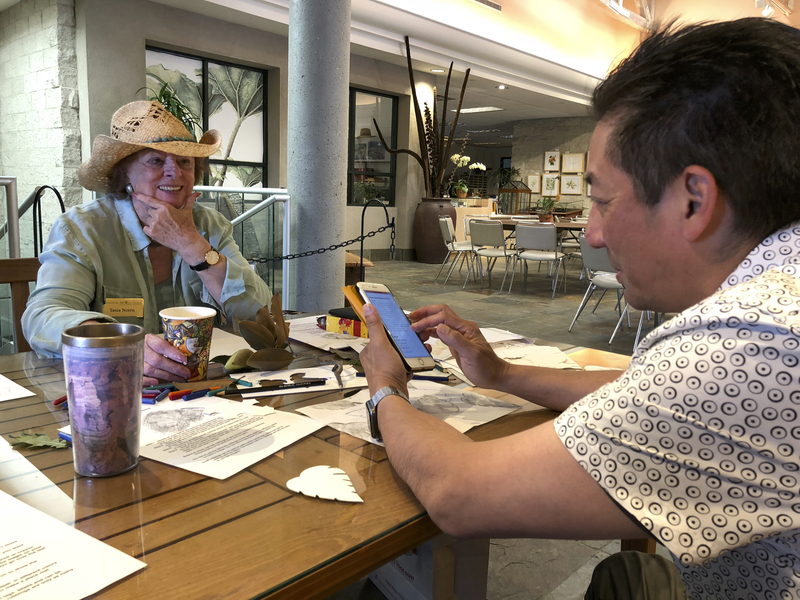 Participating artists can provide their own vellum for the workshop, or can purchase a piece from the instructor, who will provide a 10” x 13” piece of vellum for $50, payable at the workshop. Details about the workshop, enrollment, directions and a materials list can be found on the BAGSC website.